Google usually ignores punctuation and mathematical symbols from a query because it doesn’t index them. They rarely change the meaning of a query and Google’s index would have to grow a lot bigger, without improving the results too much. Some punctuation marks and mathematical symbols are used to provide advanced features (for example: colon, quotes, minus sign, plus sign). I’ve recently noticed that Google started to show results for queries like [. ], [,], [:], [;], [#], [%], [@], [^], [)], [~], [|], [“], [<], [$]. 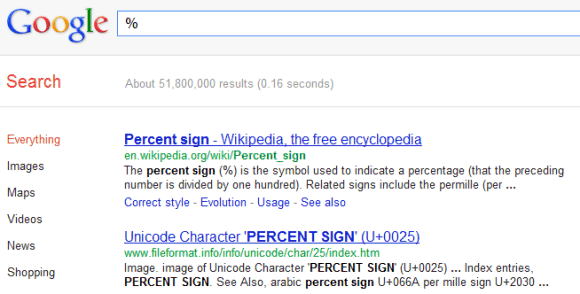 When you search for [%], Google shows the results for [percent sign] and that happens irrespective of the interface language, so it’s not a synonym generated by Google’s algorithms. Search for [:] and you’ll get the results for [colon]. Most results are about the colon from the human anatomy and they’re not relevant.